Asheba is an engaging musical storyteller who has specialized in family entertainment since1998. Born on the Caribbean island of Trinidad, he was influenced by its spectacular festival, Carnival and the folkloric oral tradition, calypso. Today, he is a renowned world musician who playfully blends calypso, reggae, neo-folk and more. Asheba developed his love of music at an early age, singing in his school choir and helping to form the band, The Creative Ones. He sang calypsos with fellow Calypsonians and reached the semi-finals in the Independence Calypso Competition. He learned the steel drum, Trinidadʼs national instrument, and played with Phase 2 Pan Groove, one of the worldʼs top steel bands. In 1989, he moved to New York City where he joined MUNYʼs subway program, Music Under New York in 1991. As a result, two of his live performances were included on Clay Dog Recordsʼ compilation CD, Street Dreams, and he was selected to perform in MADhattan, a musical variety extravaganza about New York City street performers, produced by Feld Entertainment for the New York New York Hotel and Casino in Las Vegas (1997). While in Vegas, he also hosted a childrenʼs show about the history of blues at The House of Blues. 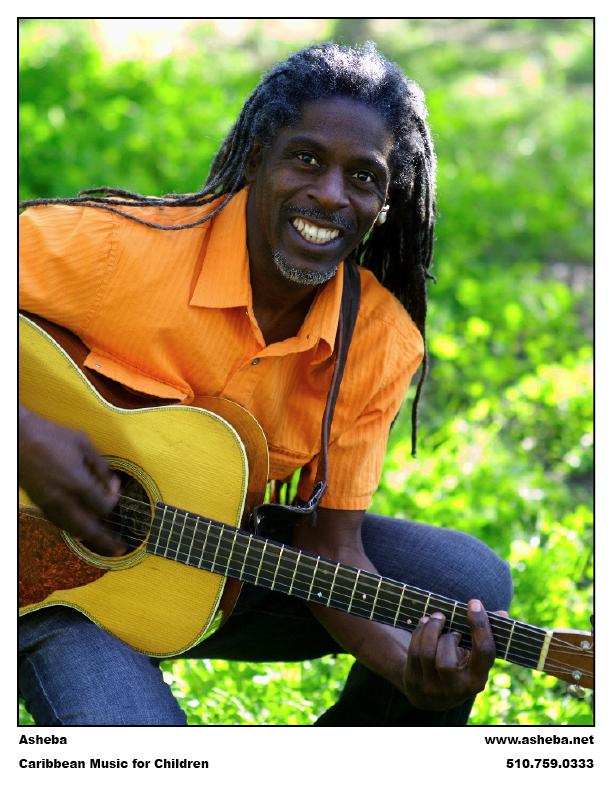 When Asheba moved to Oakland, California in 1999, he began performing family concerts at open-air markets, street fairs and birthday parties, focusing on young audiences, particularly pre-schoolers. He fine-tuned his show with regular performances at Ashkenaz Music & Dance Community Center in Berkeley, and produced the score for a childrenʼs theatre production, The Caribbean Adventure of Anancy the Spider and Friends, at Childrenʼs Fairyland (Oakland). Ashebaʼs first childrenʼs CD, Go Itsy: Music for Kids Caribbean Style, was produced in 2002 and won the 2005 NAPPA Gold Award. Next he produced No More Monkeys: Childrenʼs Songs by Asheba (2004). Both recordings have sold over 2000 copies through CDBaby.com and other outlets, and had songs selected from them for Putumayo Kidsʼ compilation CDs (Little Anancy on Caribbean Playground, 2004; Reggae Lullaby on Reggae Playground, 2005). In 2006, Asheba released his third CD, Children Are The Sunshine, which quickly became a Parentsʼ Choice Award winner. The song, Who Stole The Cookie, was selected by Continental Airlines for their in-flight kids channel, and is being aired on XM Radio, among nine other Asheba hits, including You Are My Sunshine and No More Monkeys (both of which XM Radio included on its in-flight programming for United Airlines). He also headlined the national Putumayo Kidsʼ Reggae Playground tour (performing in 16 states, 13 cities and 2 Canadian provinces), as well as concerts at Austin City Limits and Kidspalooza, where he sang Happy Birthday to, and performed with one of his inspirations, the legendary childrenʼs entertainer, Ella Jenkins. In 2007, Ashebaʼs first music video, No More Monkeys, was released in collaboration with Putumayo Kidsʼ Records. No More Monkeys is featured on their Animal Playground CD. Asheba headlined the Animal Playground US tour, where he visited 20 cities in the United States. In June 2008, Asheba headlined with his three-piece band for the ʻKidʼs Showʼ at the Sierra Nevada World Music Festival in northern California. His fourth CD, In the Kid Zone was released in 2009. The summer of 2010 took Asheba to Canada to perform at the Island Soul Festival in Vancouver British Columbia. In the fall of last year he headlined for the kids show at Full Belly Farmʼs Annual ʻHoes Downʼ Festival in central California. He spent much of 2011 working on new material. This year, 2012, when heʼs not performing at family concerts in the San Francisco Bay Area, or across the United States, we can find him in the studio producing his next project. We can expect much, much more from this prolific songwriter. New material is soon to be released — in the meantime, stay tuned!